The 1950’s music group, The Monotones1, asked the question, “Who wrote the book of love?” Six decades later, I answer the question in this book. The apostle Paul wrote it. 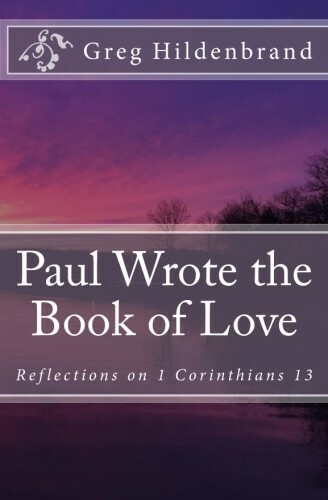 In his first letter to the church at Corinth, Paul writes a comprehensive essay on what love is and what love is not. No doubt, it was timely 2000 years ago when he wrote it, but it is still relevant today. Our society thinks too narrowly about love, usually limiting love to romance. While romantic love is one important and pleasing manifestation of love, it is far from the only or most enduring. All of us want more love in our lives, but until we know what we lack and what we desire, we cannot begin to find it. The purpose of this book is to help the reader find a true, lasting, dependable love. Fr. Richard Rohr and other Christian mystics point out that we do not think our way into a new way of acting, we act our way into a new way of thinking. The same is true for love. We cannot intellectualize our way into love. Love is an action, so when we decide to increase the experience of love in our lives, we do so by intentionally acting in more loving ways. Feelings of love may follow, but feelings cannot lead, at least not in a dependable manner. Therein lies the beauty of 1 Corinthians 13 – it provides a list of specific actions that define love. It provides some of the most straightforward guidance for how to become a more loving person, and in the process become more worthy of receiving the love of others. We reap what we sow, and this truth is never more evident than in matters of love. The first specific reference to love in the Bible occurs in Genesis 22:2, where God orders Abraham, “Take your son, your only son whom you love,” and offer him as a burnt offering (a fate that ended up not being required). A few chapters later, we find Jacob working seven years to be able to take Rachel as his wife “because of the love he had for her.” There are over 150 references to love in the Psalms alone – God’s love for us, our love for God, and our love for each other. As Moses details the laws of righteousness for the Hebrew people in Leviticus (19:18), he writes, “You shall love your neighbor as yourself.” This commandment to love others is repeated by Jesus in all four Gospel accounts, “I give you a new commandment, that you love one another. Just as I have loved you, you also should love one another.” (John 13:34) Clearly, there are many variations of love recorded in the Bible, but throughout the Bible, love is non-negotiable. Love is sacrificial in nature, meaning we hold what is dear to us loosely, willingly offering whatever we possess to our beloved. Abraham’s willingness to sacrifice his son, Isaac, was evidence of his love for God above all else. The story is immoral and inexcusable by today’s standards, but the lesson is sound – we may willingly sacrifice in otherwise unthinkable ways for the sake of love. A word of caution as we begin: This book about relationships, but it is not intended to suggest that all relationships should be endured. Abusive, unhealthy, one-sided relationships should be terminated, not withstood. An abusive relationship is perversion of how God intended us to treat each other and is never a loving relationship. Paul wrote the book of love 2000 years ago, and it remains as profound and vital today as it was in his day. This book intends to help the reader apply the timeless wisdom of the original Book of Love. Words encapsulate and narrow our lives. If we are not talking to someone, our internal dialogue is running rampant. If we are not interrupting the speaker, we are planning how to respond instead of listening with a mind open to learning something new. After we converse with another person, we often replay and analyze the dialogue. We may think of things we wish we had or had not said, or we may wonder what the other person meant by words they used or how they spoke them. The point is that immediately after an experience, we begin reshaping the experience with our words. The actual experience ends and the less-than-accurate description of the experience replaces it. The early Jewish people did not believe the name of God should be spoken. When Moses met God at the burning bush, he asked God for a name to give the people. God said, “I am who I am” (Exodus 3:14). Once we have named something, we narrow our belief about its nature. If we say, “This is a maple tree,” we believe it is not a rock or a person. As soon as we begin describing God with words, we limit the possibilities of an otherwise limitless God. Our tendency toward naming and describing makes it easier for us to understand and process our experiences, but as our words remove us from those experiences, we substitute the words for the reality. Much beauty, depth, and meaning is forever lost in the process. The Psalmist encourages us to still our minds. There are many ways to do this, all of which require focus and persistence. Yoga, meditation, centering or contemplative prayer are a few ways to silence our inner dialogue long enough to draw closer to God. God’s language appears silent to us because God does not speak as we do. In the creation story, God speaks the world into being. “Then God said, ‘Let there be light,’ and there was light.” (Genesis 1:3) God’s voice itself provided the creative power. Similarly, in the first chapter of John, the Word of God became flesh in Jesus. God’s creative language does not interface with our spoken language, and we cannot experience it as long as our internal dialogue interrupts and interprets. As the Psalmist says, we must “be still” to know God. The language of God is silence. How did I miss that? I do not know how I missed it, but somewhere in my childhood, and reinforced throughout my life, was the concept that heaven and hell were faraway places where we would go after we die. Heaven was somewhere above, and hell was somewhere below. Heaven was a paradise where we would be reunited with long-lost relatives, and hell was a place of eternal punishment where we would go if we did not live a life on earth worthy of heaven. The first recorded words of Jesus in the Gospels of Matthew and Mark, and repeated throughout the Gospels, are that the kingdom of God – heaven – is near. We consistently overlook that reality. For all the speculation about possible states of being after we die, we completely ignore that heaven and hell are present realities in our world right now, today, this moment, and in this place! Speculation about the future comes at the expense of the blessings of the now. Eternity stretches out in all directions from wherever we are at a point in time, and from that point we can experience heaven, or we can experience hell. The choice is ours because we are co-creators with God of the world we experience. Finding heaven on earth is challenging because there are so many attractive distractions that entice us to look in other directions, like possessions, positions, and power. The earth is a beautiful place with many lovely entertainments. But none of them are eternal. Finding hell on earth, however, is much easier. There are many opportunities to succumb to illness, financial straits, disabilities, loneliness, and broken hearts. When we focus on our suffering – and everyone suffers – we lose another moment in which we could experience heaven. Jesus invites us to repent (turn around) and live the good news. The kingdom of heaven is near. The kingdom of heaven is here. How did I miss that? I imagine the excitement building in Jerusalem. The crowds were ready for some gruesome entertainment. A woman had been caught in the act of adultery, and the Law was clear – she should be stoned to death. Stoning was a religious mandate that the crowds could participate in. The pious, religious authorities were there, and the people were ready to begin, stones in hand. There was one problem, however – Jesus. The Pharisees, hoping to trap Jesus into denying the legitimacy of the Law of Moses, asked him whether the woman should be stoned. Jesus bent over and wrote something on the ground. When they continued pressing him, he suggested that anyone without sin throw the first stone. One by one, the people dropped their stones and walked away. Jesus modeled a third way, a higher truth. The Law was clear, and the Hebrew people believed their salvation was dependent on obedience to that Law. Jesus did not challenge the Law. Instead, he transformed the situation by challenging the justice of one sinner punishing another. It was a brilliant move. It was a third way that did not deny the Law, nor did it condone the woman’s behavior. It forced everyone present to examine his or her own lives and actions. There may not have been other adulterers in the crowd, but there were no sinless purists, either. We have a tendency to reduce our choices to two options – right or wrong, light or dark, male or female, condone or condemn. There is a significant portion of each day that is neither light nor dark, however, but somewhere in between. The same is true for our lives. There are circumstances that are not clearly right or wrong, depending on the perspective from which they are experienced. When we narrow our choices to two, supporting one and denying the other, we limit the possibilities of our existence and perpetuate an either-or world. Thus, the importance of the third way. Finding the Third Way is seldom quick or easy, but is always inclusive and respectful of peoples and traditions. The third way may not be any one particular group’s preferred way forward, but it will allow all people to progress. The third way may not achieve perfection, but it will move us closer to a just and righteous society. One of the many shortcomings of our two-solution focus is that we become more vested in defending our position than in solving our problems. We hold a stone, and it needs to be thrown. Jesus taught that there is a third way. How did I miss that? Author, teacher, and speaker Fr. Richard Rohr likes to remind us that Christ is not Jesus’ last name. Christ is a designation for one in whom spirit and body are perfectly integrated and manifested. Christ consciousness is a state of being that has existed as part of the Godhead since the beginning of creation. Jesus was 100% human and 100% God – a perfect expression of body and spirit, and he invited us to become the same. His oft-repeated mandate, “Follow me,” did not mean to go where he went, but to become who he became – to do what he did, to love as he loved, and to heal as he healed. How did I miss that? I find ample evidence to justify that Jesus encouraged us to fully develop our spiritual natures, even as we develop our human nature. For example, beginning with John 17:20, “I ask not only on behalf of these (his disciples), but also on behalf of those who will believe in me through their word, that they may all be one. As you, Father, are in me and I am in you, may they also be in us…” Those who have come to believe in Jesus through the words of his disciples, i.e., the Gospels, are invited to become one with God, Jesus, and with each other. That proclamation of oneness with God is what got Jesus crucified. Whether by teaching or by imagination, I grew up assuming Jesus the Christ was a larger-than-life figure that I could never aspire to imitating. I, after all, am a lowly and unworthy sinner. It is evident to me now that Jesus believed differently. He not only loves us, but he envisions a divine destiny for and with every one of us. He clearly directed his disciples to continue his work, and we are the current day descendants of those disciples. To imagine becoming one with Christ while still on earth is difficult to grasp. And yet, with God all things are possible. Clearly, we underestimate our capability and our possibilities. Science has shown that we only develop a fraction of our intellectual capacity. What portion of our spiritual capacity is ever realized? Likely, it is minuscule. What if we were to truly surrender what have become the driving forces in our lives – prestige, possessions, and power – and unwaveringly centered our lives on service to others, as Jesus did? What if we became such pure and empty vessels that Christ could work through us without resistance? Dare we believe we could heal illness with a word or a touch? Dare we believe we could lift the weight of sin from another’s shoulders? Dare we believe the limitless possibilities? I think Jesus urged us so to dare. We are to become like Christ. How did I miss that?